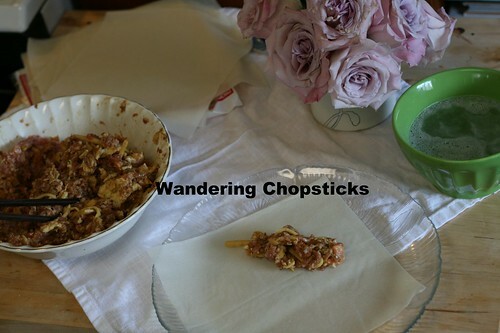 When Mochachocolata-Rita showed off her mother's Lumpia Semarang, I was intrigued at the mention of bamboo shoots, dried shrimp, and scrambled eggs in the ingredients. Semarang is the capital city in central Java with a large population of Chinese Indonesians, which would explain the pork in Rita's mother's version of lumpia. Although, I imagine ground turkey or chicken would work too for the Muslim population in Indonesia. 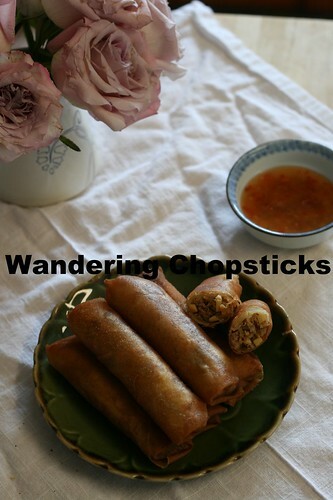 Lumpia, dervies from lunpia, the Hokkien Chinese word for popiah, which are fresh spring rolls. 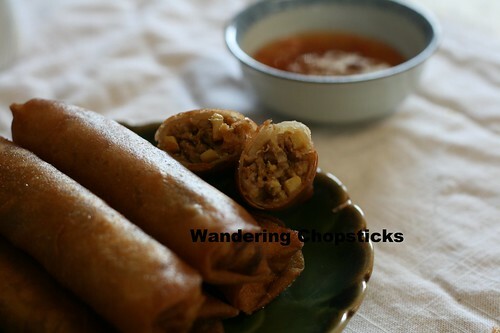 As Hokkien immigrants migrated throughout Southeast Asia, variations of popiah arose. In Vietnam, popiah became Bo Bia (Vietnamese Spring Rolls with Chinese Sausage, Jicama, and Eggs). Lumpia Semarang can be eaten fresh or fried. In the former case, obviously all the ingredients would need to be cooked first before wrapping. 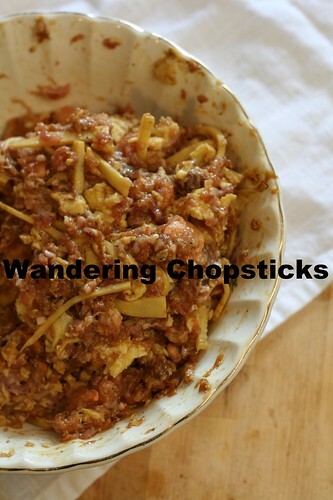 As I was making the latter though, I opted to use raw ground pork and to slice the bamboo shoots into strips to bind the filling ingredients better so nothing falls out when one bites into the egg roll. I soaked the dried shrimp to soften it, then put it in the food processor to break up in smaller pieces, similar to how Vietnamese people make dried shrimp topping for dumplings. I used a generous tablespoon of Indonesian kecap manis in the marinade since the Wikipedia article on lumpia mentioned that Lumpia Semarang were supposed to be on the sweeter side. Then it was a simple matter of wrapping and frying egg rolls as normal. The taste was a nice umami earthiness from the dried shrimp and bamboo shoots. I served the egg rolls with bottled sweet chili sauce. 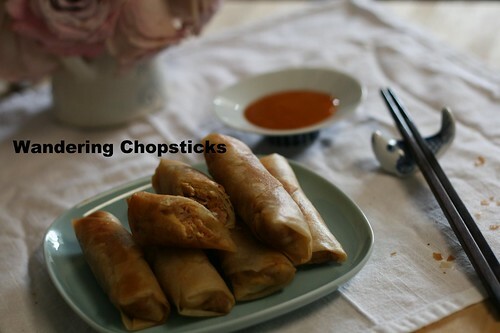 Quite a nice change from my usual Cha Gio/Nem Ran (Vietnamese Spring/Egg Rolls), so I hope you give these a try. Place 1/2 cup dried shrimp in hot water to soak for about 15 minutes. Meanwhile, peel and devein and roughly chop 1/2 lb of raw shrimp. Or you may use cooked shrimp if you wish. Scramble two eggs. Set aside to cool. Julienne 1 cup bamboo shoots. Drain the dried shrimp and squeeze to remove excess liquid. Shred the shrimp by hand or in a food processor until roughly chopped. I sauteed the shrimp until dry to make Vietnamese-style dried shrimp topping, but this step can be quite time-consuming and unless you're going to use the dried, reconstituted, and then dried again shrimp topping for dumplings, this step can be skipped if you wish. 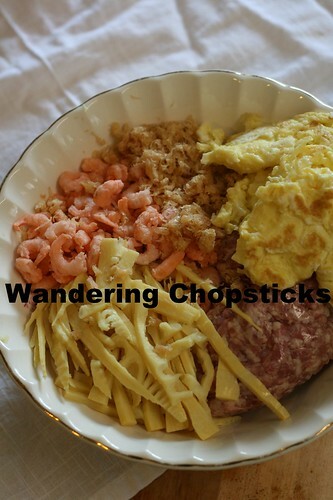 In a bowl, 1 lb ground pork, the fresh and dried shrimp, the scrambled eggs, the julienned bamboo shoots, 1 tblsp kecap manis, 1 tsp salt, and 1 tsp ground black pepper. Mix thoroughly, breaking up the scrambled eggs. Separate the egg roll wrappers. Dip one corner of the wrapper in a bowl of warm water. Lay out the wrapper on a plate. Spoon a small amount of the filling on the opposite corner of the dipped corner. Fold down the top, then the sides of the wrapper. 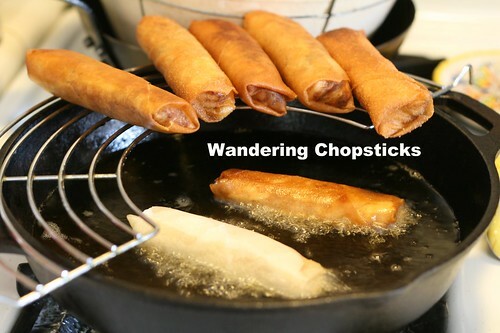 If you're not sure how, you can see the step-by-step directions in my Cha Gio/Nem Ran (Vietnamese Spring/Egg Rolls) recipe. Fry on medium-high heat until golden brown. Drain. 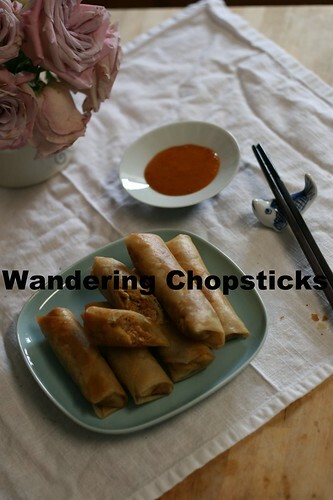 Serve with sweet chili dipping sauce. A close-up of the bamboo shoots in the filling. If you have leftover filling, you can make Indonesian Semarang-Style Turnovers with Bamboo Shoots, Dried Shrimp, and Scrambled Eggs. 1 year ago today, traditional and piggy mooncakes. 2 years ago today, Indian Restaurant - San Gabriel. 3 years ago today, Farfalle with Oven-Dried Tomatoes, Mushrooms, and Corn. 4 years ago today, Lil' sis abandoned me :( and why we're such daddy's girls.